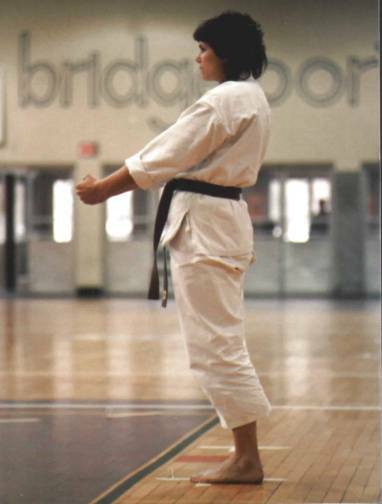 1983 North Atlantic Regional Championships, Bridgeport CT - Daria Moravek performs Bassai Dai. The UConn team - Front row: Matte Thomas (1st place womens kata & kumite), Tom Hine, Seth Lapuk, Dana Manner, Karen Anthony, Daria Moravek, Maura Graham. 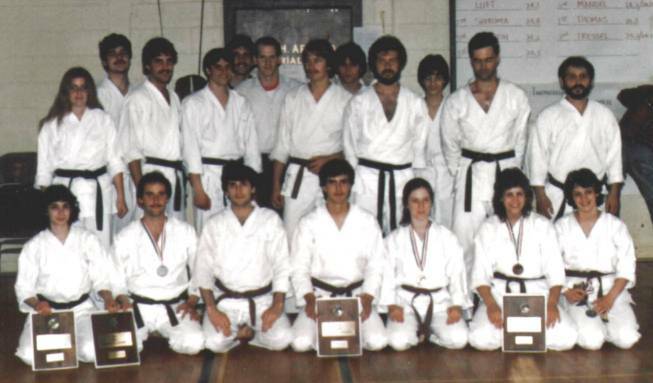 Back row: Mary Rigdon, Frank Cassetta, Steve Kissel, Dennis Campbell, ?, Jim Klucznick, Mike Bray, Chuck Ausburger?, Mark Blake, Ernie Beckwith?, Bob Jacobs (1st place mens kumite), Jim Cognetta.